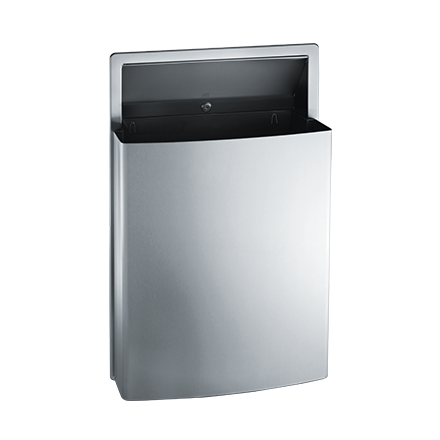 Easy maintenance—removable stainless steel waste receptacle locks into cabinet with a tumbler lock for security. Capacity 11.2 gal. (42.6 L). Fabricated of 20 gauge type 304 stainless steel with satin finish. Waste receptacle is emptied manually. Disposable liner bags (by others) may be purchased to hang on internal hooks or may be draped over rim and held in place when receptacle is locked into cabinet. Keyed tumbler lock prevents unauthorized removal.